Being The Answer Guy, I get asked a lot of questions about not only our 2013-era focus on Integrated Marketing and Influency, but also, more broadly, computers. How DO those things work, anyway? When Windows 8 was approaching release I did some testing of the new operating system—not so much because I was excited to upgrade but because Microsoft had announced the end of support for Windows XP. I don’t really need help with Windows, but ‘the end of support’ means that there will be no more security upgrades, and in our always-connected (or EVER connected, actually) world that’s just not acceptable. This meant that I needed to choose between replacing many of the computers at Answer Guy Central or upgrading the operating system in them. I tried going the upgrade route on two of the computers recently. Moving what was my laptop before I switched to an Acer Netbook a couple of years ago and then to a Chromebook last year was surprisingly easy. And that laptop is now used for little more than random web browsing by a couple of Answer Guy Central denizens; not only did the migration to Windows 8 work, but the computer, reformatted, actually runs better now than it did when we put it in service five years ago. Last week, I tried moving the computer I use when I’m in the office to Windows 8. It did not go well. I tell this story as a cautionary tale; Influency is about controlling a lot of things, and although I’m less and less inclined to even bother chasing Microsoft any more, I have some specific needs for doing a couple of things here at Answer Guy Central. Video editing on-line leaves me cold, for example; there are lots of reasons to do that directly on your local computer. So on the day before its fifth birthday I began trying to upgrade my Dell Vostro 400 Desktop computer to Windows 8. Despite its seeming old age this computer is up to every task I throw at it even today—or it was until a week ago. I have four gigabytes of RAM memory in this thing, and it rocks a Quad-core processor. And amazingly, after five years I’ve never even need to wipe things clean and start over to get rid of the gunk that builds up over time. And then I installed Windows 8. Nothing went “wrong”. The upgrade process checked everything, warned me about a couple of potential hardware and software incompatibilities, and then, after I removed the offending items and continued the upgrade process, chugged away for a few minutes and presented me with a Windows 8 computer in pristine condition. And then WiFi got cranky. Not a little cranky. WAY cranky. It would run for a few minutes and then die, and most of the time when the WiFi crashed, the computer crashed, too, to the point where hitting the power button was the only option. I spent pretty much a full day checking everything there was to check. I replaced the WiFi adapter with a new one that was officially Windows 8 compatible. No dice. For reasons unknown, this computer wasn’t taking to Windows 8. I replaced it. I’m now running a Lenovo computer with double the RAM, a new, fast processor, and again, four cores. And Windows 8 itself is astonishingly fast, but as I suspected most of the software I use performs no better now than it did on the five-year old Dell. And I’m using the WiFi adapter that seemed to be causing problems on the Dell. Which means I need to play around. Because, well, again, I’m The Answer Guy and there were a bunch of open questions. Windows 8, whatever you think of how it looks and acts or its Jekyll-and-Hyde interface designed to accommodate tablets, phones, and computers but not really doing the best job on the latter, is actually pretty terrific. Yes it takes a bit of getting used to, but it works, and well, and some of the things that have always driven people crazy about computers—like several-minute-long boot-ups—are gone. And that’s where Windows 8 goes wrong. The reason computers have always taken so long to boot is that there are quite a few steps that need to be taken sequentially before you see the working interface you’re familiar with. First, the computer’s BIOS runs, making a few diagnostic checks. Then, the BIOS looks for the operating system. Then, the operating system runs tests of its own before it starts the process of making itself useful to you. Windows 8 crams all of those things together; it actually controls the BIOS routine in your computer, and while it isn’t as fast as a Chromebook’s five-second boot, a computer running Windows 8 and using a new-era BIOS will boot and be useful in about fifteen seconds. Which means that the operation of external hardware like my USB-powered WiFi Adapter that doesn’t integrate with the computer at all the levels Windows 8 wants it to is questionable. I didn’t know this. I blame mostly me for that, but I also blame Microsoft for not talking about it. I know; most people don’t understand this kind of thing, so why bother them with details they don’t need? Because Microsoft makes a point of telling people that Widows 8 won’t run certain older software, like older versions of Microsoft Office. Oh … and because that’s a lie. I’ve haven’t felt the need to upgrade Office since 2003, and actually prefer the way that version of Office works to more recent versions. And Office 2003 installed under Windows 8 without a hitch, even though Microsoft swears it won’t work at all. In other words, Windows 8, whatever else you think about it—and let me repeat that I like it—is an example of Microsoft misdirecting us, but only when it’s convenient for them. Comment on the new BIOS integration? There’s no money in that. Lie about software compatibility? That’s another story. What’s this have to do with Influency*? I’ll tell you. You want to be Microsoft. You want to communicate in a way that tells people what they need to hear and stays away from subjects that can confuse your message. 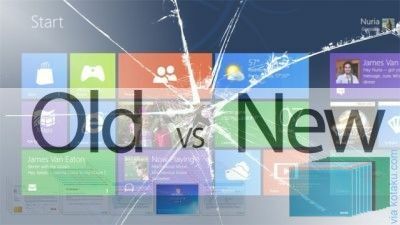 For example, Bill Gates recently commented on what’s wrong with the iPad and why people would move away from it to PC-based tablets. His comment was ludicrous, but as I point out here, the idea was that iPads make things inconsistent when compared to Macintosh computers, whereas Windows 8 looks the same—sort of—on anything. Gates’ point got lost and was reacted to by most people negatively, even though it was sound. But you don’t want to be on the OTHER side of Influency; you need to be able to cut through the garbage. So: Windows 8: Good. Sort of. Microsoft’s marketing, as usual, awful to non-existent. And your place in all this? You’re after Influency.